Cervid production is a $3 billion industry in the US. 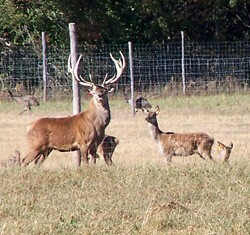 There are many opportunities for farms to raise deer, but proper care and health management is critical. NYS Department of Agriculture and Markets hosted Dr. Douglas Wagner, Newport Labs to cover the topic for their veterinarians. The recording was made available to provide a resource for farmers and veterinarians to learn more on the topic. Dr. Wagner introduces and provides an overview of the captive cervid industry in the United States, including husbandry, handling, reproduction, stocking density and Biosecurity. He presents information on the most economically important diseases and parasites of captive cervids, and a system for producers and veterinarians to use when determining herd specific vaccination and deworming protocols, with good husbandry standards and biosecurity as the cornerstone.